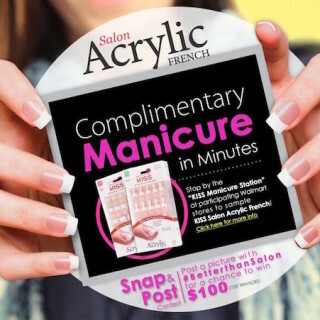 Expired: Free Kiss Salon Acrylic French Manicure Set at Walmart on Saturday, April 11th! Stop by any participating Kiss Salon inside Walmart on Saturday, April 11th from noon until 4pm and you will get a complimentary Acrylic French Manicure Kit. As part of their promo, if you post a picture on social media at their event, you’ll also be entered to win an extra $100. Go here for more details. This Facebook post says it’s available just on Saturday, April 11th, but we’ve seen reports that you can also go in any day between Thursday, April 9th and Sunday, April 12th. We recommend calling your closest location to ensure they’re participating and find out which day(s) it’ll be available. What a lovely deal! Thanks for sharing. My nail are short I need nail . Hey Hailey! This offer is expired now, Haily! 🙁 We’ll keep you guys posted if it becomes available again!